To the extent I can I'm avoiding the mainstream media reporting and commentary on the shooting of Trayvon Martin. The analysis I've seen is largely nonsensical, and the media seems primarily interested in creating drama where none exists. The case will not be fraught with difficult legal issues, it will be an open-and-shut case for the prosecutor. Why? Yesterday (20 April) George Zimmerman testified in his bail hearing, and his words effectively convict him. Here are his opening words after identifying himself: "I wanted to say I am sorry for the loss of your son. I did not know how old he was. I thought he was a little bit younger than I am. And I did not know if he was armed or not." 1. "...I did not know if he was armed or not." Under Florida's "stand your ground" law, one is justified in using deadly force only if she/he "reasonably believes that such force is necessary to prevent imminent death or great bodily harm to himself or herself or another or to prevent the imminent commission of a forcible felony." Zimmerman has now stated, under oath, that he didn't know whether Trayvon Martin was armed or not. In effect, he's denied he had reasonable belief that death or great bodily harm was imminent. 2. "I wanted to say I am sorry for the loss of your son." In this instance, apologizing and expressing regret is equivalent to saying he agrees he was in the wrong. The prosecutor will have no trouble at all getting a conviction, and the only way this will not happen is if Zimmerman pleads guilty before this goes to trial. The best Zimmerman can do for himself at this point would be to plea bargain and attempt to get a relatively light sentence. But he has no defense. Zimmerman is clearly guilty, and I hope he receives, and serves, the maximum possible sentence. But a guilty plea seems very likely at this point. Addendum 22/04/2012: I should add that "reasonable belief" requires one have facts and make reasonable inferences from them. There were no facts that would lead Zimmerman to believe Trayvon Martin was threatening a forcible felony. And when Zimmerman approached Martin, it was Zimmerman who was initiating the hostile confrontation and Martin who may have had the reasonable belief. We don't know if there really was a fight, but if there was and Zimmerman had been killed, Martin would have a strong defense under the Florida law. It's outrageous that progressives and leftists simultaneously criticize the law as if it tied prosecutors' hands, and simultaneously demand Zimmerman be prosecuted. If their interpretation of the law were correct, Zimmerman couldn't be prosecuted. They should be demanding investigation of the local prosecutor who refused to file charges in such an easy and obvious case. But there's no political mileage in that -- and one mustn't waste any opportunity to demonize one's political opponents, no matter how self-contradictory and dishonest the charges. And evidence that Paul Krugman is a nasty political hack. When may one legally employ deadly force in self defense? There are three criteria that must all be met in order for a citizen to legally employ deadly force. A failure on even one of the three means that deadly force is not called for, and one can expect to be prosecuted if one employs it. The criteria in a nutshell: (1) the person against whom the force is employed, the attacker, shows intent to inflict deadly harm, (2) the attacker has the means and ability to do so, and (3) there’s no easier solution than employing deadly force in defense. The "stand your ground" principle reduces the difficulty of meeting the third criterion, but doesn’t eliminate it. It simply says that if a person is attacked, or has reasonable grounds to believe s/he is about to come under attack, s/he can't be prosecuted for not having fled. If the facts that have been reported are correct, it seems obvious that George Zimmerman cannot establish even one of these criteria were met. But even worse for him, if one initiates the conflict, one can't then rely on these three criteria for a defense. You can't start fights and then claim self defense if your victim resists. If the accounts reported in the press are true, then by his own admission, and against police advice, Zimmerman started the fight... if there even was a fight, which is doubtful. Trayvon Martin was walking on a public street, minding his own business, when this armed thug approached him with hostile intent. Zimmerman trailed and approached his unarmed victim after having been told by police not to do so. By his own account Zimmerman then challenged Martin and provoked a confrontation. Martin did not wield deadly force (but possibly was entitled to do so). He might or might not have resisted Zimmerman, but regardless, it's an open and shut case against Zimmerman. Zimmerman armed himself and then initiated the conflict, while Trayvon Martin was not engaged in threatening behavior, but in entirely innocent and unsuspicious behavior. Martin was unarmed. Zimmerman has no defense, and "stand your ground" is irrelevant to the matter. That Zimmerman was not charged initially is outrageous. It is completely unbelievable to me that this was anything other than the police and prosecutor saying "we don't prosecute white men for killing black teens." For all these reasons I signed the petition calling for the State of Florida to go after Zimmerman, and I'm glad they did. I could stop here but for the crazy discussion and commentary in the press over this vicious crime. Somehow, instead of focusing on the obvious malfeasance by the local authorities in this case, the press, commentators, and political hacks of the left have tried to pin blame on the "stand your ground" law. This is simply, well, crazy. Under Florida's "stand your ground" law, Trayvon Martin had no obligation to flee Zimmerman. Had he managed to grab Zimmerman's gun and kill him, he'd have had a perfectly good defense with this law protecting him. The law does not provide any justification for Zimmerman's action. Local authorities didn't fail to prosecute Zimmerman because their hands were tied by the law, they simply refused to enforce the law, presumably for racial reasons. I think this will be clear when the Special Prosecutor, Angela Corey, wins an easy conviction in the case. The entire episode has been a sequence of outrages, beginning with Zimmerman's attack, followed by the refusal of the local authorities to do justice, and then followed by the insistence of the media and commentators to try the case (e.g. I heard one Michigan Public Radio newscaster refer to the "murder of Trayvon Martin" early in the case), misrepresent the Florida law, and attack scapegoats such as the American Legislative Exchange Council (ALEC). Paul Krugman, once a respectable economist, chose to lie boldfacedly about the law, falsely describing it as a law that allows you to shoot anyone you consider threatening and not face arrest. He also manages to blame ALEC, the Koch brothers, Exxon-Mobile, and their conspiracy to destroy democracy. He so misrepresents the law and the situation that it's hard to know how to respond, other than to note he's become a despicable scoundrel who will say anything for political points. The "stand your ground" principle is important. There's no reason at all that honest citizens, minding their own business, should be vulnerable to prosecution for insufficiently getting out of the way of their attackers. An honest application of the law would find that Trayvon Martin had no obligation to flee Zimmerman. If progressives like Krugman or the hacks in the media really cared about justice, they would defend the law and be screaming for investigation of the local authorities for refusing to prosecute Zimmerman. Instead, they are using this to demonize and attack their political opponents. There's something ironically Zimmermanesque in their behavior. "Show you're legal. You do have to do that." What does "rule of law" mean? ... a pertinent question in light of the SCOTUS decision in Florence. Today (4 April) on NPR's "Morning Edition" there's an interesting interview with South Carolina Governor Nikki Haley. The entire interview is worth hearing (early on she discusses the bigotry she still faces from some conservatives and speaks eloquently about judging individuals on their personal merits), but especially appropriate is the discussion of immigration beginning around 7:00. Governor Haley observes that "we are a country of laws" and that it is absolutely necessary that we follow the rules or we "lose everything." Asked about what happens when the laws result in innocent people being targeted by police because the police don't like the way they look, Haley responds "I have faith in our law enforcement." Incredulous, Inskeep points out the case of a foreign businessman, legally visiting America, who was arrested because he couldn't immediately prove to the police that he wasn't an illegal alien. Haley's response? 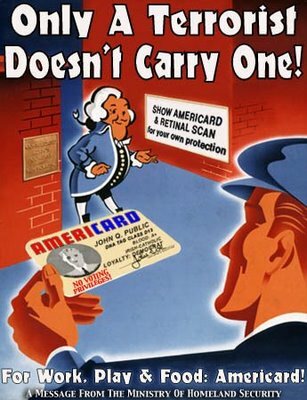 "You do have to carry identification that shows you're legal. You do have to do that." Боже мой! This was Soviet law -- everyone carries mandatory ID and is subject to arrest without it. But she's right, the burden of proof is on us -- we're assumed "illegal" unless we can show otherwise, we "do have to do that." SCOTUS already ruled a few years ago that police could demand an ID and arrest someone if they refused to provide it. And now, thanks to the conservative justices' opinions in Florence, we're also subject to strip searches...all for not carrying ID that satisfies the police. Yes, "faith in our law enforcement," there's the "rule of law" for you. Conservatives (correctly) warn us of the dangers of soft despotism, creeping tyranny, and the slow slide to a total state, but their protests are utterly incredible... they are helping lead the way in building tyrannical laws. The conservative position expounded by Haley confuses "laws" and "law enforcement" with the rule of law. She's simply endorsing obedience to whatever regulations the state happens to pass; her "rule of law" is perfectly compatible with Soviet laws, sharia laws of Taliban, or any other codified regulations imposed by authorities. But the original meaning of "rule of law" was a (classical) liberal concept: the Law is the natural law of individual rights, as expounded by John Locke, Frederic Bastiat, and the like -- and the state is to be constrained by it. That's why it was "the rule of law, not the rule of men." Conservatives like Haley seem to think that whatever rules they pass must be obeyed, and that's the rule of law. They are wrong; that's the rule of men, and it's tyranny. And with Florence, SCOTUS leaves unrestricted a state power to harass, intimidate, and abuse citizens, even those not even charged with a crime. 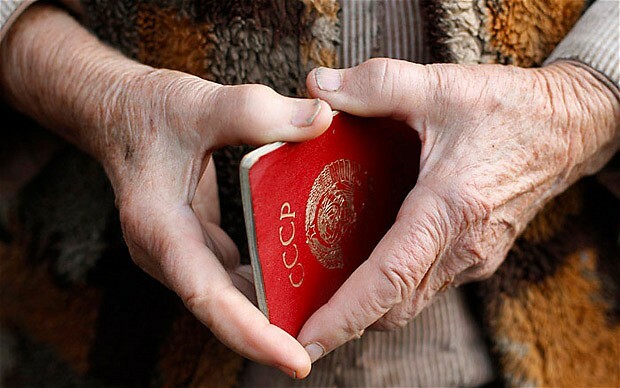 Photo: A Soviet internal passport. At least five justices seem to have no understanding of the Fourth and Eighth Amendments to the Constitution, at the very least. Their outrageous decision in Florence is another important piece in the construction of the American police state. Welcome to the United Socialist State Republic of America (as Nouriel Roubini termed it), where things are run for the benefit of police and jail administrators, mercantilistic financiers, politicians, bureaucrats, and the rest of the politically connected. Today anyone could be legally strip searched, repeatedly, without any charges or even probable cause... and have no recourse at all. If only we could require SCOTUS to do empirical research before they make their decisions. Justices Kennedy, Thomas, Alito, Roberts, and Scalia all needed a good deep, careful inspection so that they could understand what they were voting on. Ironically, these are the same justices that constituted the majority in "Heller." When the police come to strip search the innocent, at least the innocent can be legally armed. I really do not follow the reasoning of these justices... strict interpretation of the Constitution at intermittent intervals? Citizens' United and Heller both strictly defend the rights of the individual against the state; Florence refuses to even consider there might be a limit on police power on citizens' behalf. Tom Ashbrook had a great discussion of Florence today. Ugh. On 31 December of last year "we" at Unforeseen Contingencies made a few predictions for 2012. The first quarter of 2012 is now behind us, and generally our predictions are looking pretty good. Most of our other predictions also seem no less likely that they did three months ago, although many court watchers are now wondering about SCOTUS and the PPACA (Prediction #5). Prediction #10 looks a little doubtful now, but we are happy to stand by it, because Predictions #2, #7, #8, and #9 still seem good to us, and the spillover of wars, rumors of wars, and foreign economic crises could easily make unemployment increase in the U.S. Prediction #11 is the one we're most concerned about: the discovery of life on another planet. NASA researchers now suggest that by 2014 humans will likely discover an Earth-like exoplanet in the "habitable zone" of its star. That's good news for our prediction; OTOH the time window is a little too big for our comfort. And simply finding such a planet is not a "hit" for us. The planet will have to have life that we can detect -- perhaps engineering, or possibly vegetation seasonal patterns -- something dramatic. Hence prediction #11 is, in "our" estimation, looking a bit less likely as each day passes. We at Unforeseen Contingencies stand by all our predictions, of course -- the sport in end-of-year predictions this is seeing how they come out, not in updating them as new facts develop. We do think, incidentally, that Prediction #11 is almost a certainty within the near future, say 10-15 years. And when it occurs, it will radically change the way humans perceive the universe. Whether that radical change is swift and dramatic or slow and subtle will depend on what is discovered, but it is coming. 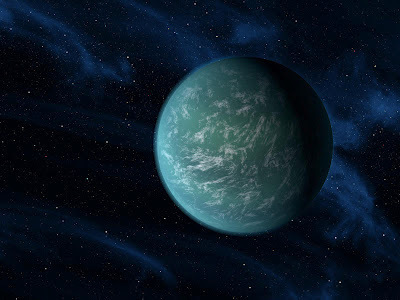 Picture: artist's conception of recently discovered planet Kepler 22b, circling a Sol-like star in the habitable zone, but thought too big to be "Earth-like." From Space.com.